Wired for instant access to classic tones without needing a single patch cable, the Synthesizer Box is a modern, complete semi-modular, monophonic synthesizer module. The Synthesizer Box is 100% analog and 100% Eurorack compatible with a complete set of patch points able to override the internal audio and CV signal paths. 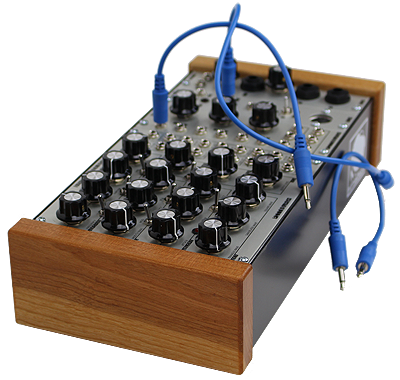 The Synthesizer Box was designed to be the core of any modular system. Each major component is fully patchable and can function independent to the rest of the module. This allows the functionality of the Waveforms Oscillator, Lopass Gate, LFO, Envelope Generator, and VCA to be split apart and used like standalone modules. The Waveforms oscillator is the heart of the Synthesizer Box. Complex modulation, voltage controlled waveform morphing, and a sub oscillator allow for a deep tones and rich timbres. Frequency Modulation (FM) - Used to modulate the pitch of the oscillator, The attenuated FM input can be switched between exponential and linear response. The FM input is internally patched to the LFO triangle output. This routing can be bypassed by patching into the FM CV IN input jack. Saw / Blade Switch - Selects the type of saw wave sent to the mixer. The SAW wave is the core wave of the oscillator and is not effected by the MOD CV input. The BLADE wave is a unique, complex saw wave that can be modulated using the MOD CV input. Additional manipulation of the blade wave can be achieved using the BLADE IN jack. Waveform Modulation (MOD CV) - Attenuated MOD CV input controls the amount of waveform modulation. Waveform modulation effects the square wave and blade wave. The modulation effects each wave type differently. Pulse width modulation of the square wave and wave shape morphing of the blade wave. The MOD CV input is internally patched to the LFO triangle output. This routing can be bypassed by patching into the MOD CV IN input jack. 1V/O IN - One volt per octave input. BLADE IN - Blade wave manipulation input. FM CV IN - Frequency modulation input overrides internal routing to allow for external modulation. MOD CV IN - Waveform modulation input overrides internal routing to allow for external modulation. TRI OUT - Post mixer triangle wave output. S/B OUT - Post mixer saw or blade wave output. SQR OUT - Post mixer square wave output. MIX OUT - Mixer output includes triangle, saw/blade, square, and sub oscillator waveforms. The LPG is a distinctive module that incorporates both a low pass filter and VCA. The lopass gate is unique in the way that it simulates the characteristics of natural instruments. When used in LPG mode, additional harmonic content is added to louder sounds while quieter sounds pass through unmodified. This behavior imparts a rich, organic quality on the sounds. Frequency Modulation (MOD CV) - Attenuated MOD CV input controls the amount of lopass gate frequency modulation. Mod / Ping Switch - Determines how the lopass gate responds to frequency modulation. In MOD mode, the MOD CV is used to sweep the frequency range of the lopass gate. In PING mode, the MOD CV is converted to a short trigger used to ping or strike the lopass gate. The PING mode takes advantage of the lopass gates fast attack and slow decay to create organic percussive sounds with a natural decay. The MOD CV input is internally patched to the envelope generator output. This routing can be bypassed by patching into the LPG CV IN input jack. Frequency Control - In filter mode, the frequency knob controls the center frequency of the filter. In VCA mode, the frequency knob controls the pass through signal level. In lopass gate mode, the frequency knob controls both the center frequency of the filter and the pass through signal level. Resonance Control - In filter mode, the resonance knob controls the amount of resonance. In VCA mode and lopass gate mode, the resonance knob is not active. LPG Mode Switch - Switch between the 3 modes of the lopass gate. VCA position (up) enables VCA mode, LPG position (center) enables lopass gate mode, and LOPASS position (down) enables low pass filter mode. LPG CV IN - Frequency modulation input overrides internal routing to allow for external modulation. LPG IN - Signal input overrides internal routing. LFP OUT - Signal output. Wide Range LFO is perfect for long sweeps or audio rate frequency modulation. Rate Knob - Selects the frequency of the low frequency oscillator. Range Switch - Determines the range of the rate knob. Switches between low range and high range. TRI OUT - Triangle wave output. SQR OUT - Square wave output. Attack Knob - The first stage of the envelope generator. The attack knob adjusts the rise time of the envelope. Decay Knob - The second stage of the envelope generator. The decay knob adjusts amount of time the envelope remains at the maximum level while the envelope input contains a signal. Sustain Switch - The third stage of the envelope generator. The sustain knob sets the maximum output level of the envelope once the decay stage has completed. Release Knob - The fourth stage of the envelope generator. The release knob adjusts the amount of time it takes for the envelope to turn off once the decay stage has completed. ENV IN - Envelope input. ENV OUT - Envelope output. Hardwired between the 1 Volt Per Octave Input (1V/O IN) and the waveforms oscillator. Time Knob - Adjusts the amount of time it takes to shift from one frequency to another. Triangle Wave Attenuator - Adjust the level of the triangle wave sent to the TRI OUT and MIX OUT. Saw / Blade Wave Attenuator - Adjust the level of the saw / blade wave sent to the S/B OUT and MIX OUT. Square Wave Attenuator - Adjust the level of the square wave sent to the SQR OUT and MIX OUT. MIX OUT (in waveforms section) - Mixer output includes triangle, saw/blade, square, and sub oscillator waveforms. High quality, linear voltage controlled amplifier. CV Input Attenuator Knob - Adjusts the output level of the VCA. VCA CV IN - CV input. The VCA CV IN input is internally patched to the ENV OUT output. This routing can be bypassed by patching into the VCA CV IN input jack. VCA IN - VCA signal input The VCA IN input is internally patched to the LPG OUT output. This routing can be bypassed by patching into the VCA IN input jack. VCA OUT - Signal output. Monophonic - Monophonic mode works great when using a modular as a single voice synthesizer. Gate2 and CV2 outputs mirror the outputs of Gate1 and CV1. Monophonic mode retriggers the gate with each new note played. To change this response to the classic trigger gate mode press C3 when assigning the midi channel. Duophonic - The Midi2 module uses the two sets of Gate and CV outputs to allow two notes to be played simultaneously. The first midi note is sent to the Gate1 and CV1 outputs and the second is sent to the Gate2 and CV2 outputs. Duophonic mode is perfect when working with a two voice modular synthesizer. Dual Monophonic - Gate 2 and CV2 outputs are controlled by a different midi channel than the Gate 1 and CV 1 Outputs. Dual Monophonc mode allows a modular to be controlled by two separate sets of midi data. This mode works well when using a modular as two single voice synthesizers. CV1 Output – 1 volt per octave voltage derived from note played on keyboard. CV2 Output – 1 volt per octave voltage derived from note played on keyboard. Sync Output – Outputs gate based on beat 1 of the incoming midi clock. Midi Input – Input jack for a standard 5-pin midi cable. The simplest way to get sound out of a modular. Outs is a dual independent output module featuring a stereo 1/4" headphone amplifier output and dual mono 1/4" line level outputs. Dimensions: 10.5" x 7.5" x 5"